Strikes continued in Poland Wednesday as miners protested government plans to close four state-owned coal mines. The center-right coalition government led by the Citizen’s Platform, with newly-elected Prime Minister Ewa Kopacz, is attempting a radical shakeup of the mining industry, which it says is losing money in an ailing market. The standoff involving miners in 12 sites undertaking underground occupations, the hunger strikes, and railway blocks extended after negotiations between the government and strikers broke down Monday. The head of the trade union confederation Solidarnosc, Piotr Duda, has said that if an agreement is not met with the trade unionists by Tuesday the miners would be joined on strike by workers from the railways and energy sector. “We will give the government one more chance, although we cannot wait long. This is a matter concerning all workers. Today it is miners, tomorrow railway workers and the next day it will be energy sector workers,” he said. The planned closures will lose 5,000 jobs and cost the government US$636 million. Around 90 percent of Poland’s energy generation is made up by coal, although increasingly this is being bought cheaply from Russia. State-owned Kompania Weglowa, the largest hard coal mine in Europe with 50,000 workers, lost US$194 million in 2013. If only the normal, decent relations between the police and the community could be re-established, this problem could be resolved. Poor people in general are more likely to be the victims of crime than anyone else, this reasoning goes, and in that way, they are in more need than anyone else of police protection. Maybe there are a few bad apples, but if only the police weren’t so racist, or didn’t carry out policies like stop-and-frisk, or weren’t so afraid of black people, or shot fewer unarmed men, they could function as a useful service that we all need. This liberal way of viewing the problem rests on a misunderstanding of the origins of the police and what they were created to do. The “Walmart Economy” isn’t just hurting America – the multi-billion dollar corporation’s impact extends globally. The Waltons, owners of Walmart, are the richest family in America, worth more than $150 billion. That’s equal to the wealth of 43% of American families combined. Yet many workers at Walmart stores, warehouses, and suppliers around the world face low pay or unacceptable working conditions. From California to Bangladesh, Mexico to South Africa, many workers at one of the wealthiest retailers in the world struggle to make ends meet. Chilean communities have had enough. Starting Thursday, some 12,000 Walmart Chile (Lider) workers went on a nationwide strike demanding better wages. It’s reported that approximately 70 store locations are struggling to operate. In the Maipu & Concepcion comunas (or counties), all Walmart supermarkets are completely shut down. Workers are on strike because the company has not responded to its request for salary increases. Manuel Diaz , president of the Federation of Walmart Chile, said workers are asking for a raise. Chilean Workers have also been picketing and calling on customers not to buy from the corporation’s supermarkets. Diaz said the response from Chilean communities has been supportive, even during the busy holiday season, and that protests will continue as workers wait through the negotiation process. 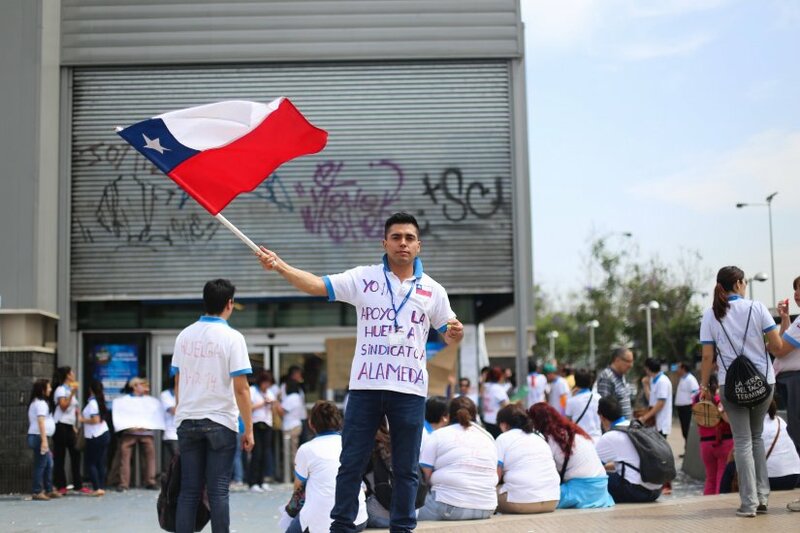 In a public statement, Walmart Chile said it regrets the decision by workers to strike, and that the company is confident they will reconcile the demands of workers with what the company is able to offer. This is not the first sign of labor unrest in Walmart stores abroad. Just this year, Walmart workers in over ten countries stood in solidarity with American Walmart workers, calling for decent pay and decent work. The “Global Day for Decent Work at Walmart” saw actions in the United States, Brazil, Mexico, South Africa, India, Canada, Argentina, and Chile. In the past two years, Chinese Walmart workers have protested issues ranging from store closings, retaliation against workers who speak out, and cuts to worker benefits. Last month, Walmart workers and community supporters held events or strikes in over 1600 stores across America, protesting how Walmart bullies workers that speak out about issues like fair pay. From Monday, workers at four warehouse sites throughout France could down their tools just days before Christmas, when Amazon is at its busiest time. Amazon claims that this strike won’t affect their business. Sebastien Boisonnet, a CGT delegate who called the strike, says industrial action will have a major impact on the US company’s deliveries and will damage Amazon’s reputation that one click online will send a package to your door. Amazon strikers in Germany went on strike last week which caused the brand to send more of its orders to France to fill. Boisonnet says that the strike is not to upset customers or to block the trucks delivering Christmas parcels, but for Amazon to pay attention to worker claims. CGT is calling on Amazon to open negotiations on work conditions and salaries. 40% of Amazon’s staff are members of the CGT union, the first union to organize workers in the company. But there are fewer card-carrying union members in Northern France.